Visiting San Francisco can feel like time-traveling to the future (even though we haven’t invented time travel yet). Life here is perhaps 1,000 years ahead of the rest of the world but luckily it can still be explained by stuff that’s been around since the 80s. Here are 10 future tech trends explained in terms of the past in a way that any present-day person can understand. Soylent is a liquid substance that comes in a 14-ounce bottle in various flavors and can be consumed in place of a meal. Present-day citizens may have heard of something like this called Slimfast. 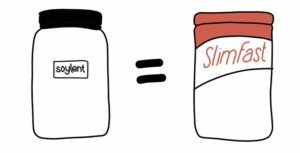 The difference is that Soylent was reverse-engineered by hackers to recreate the nutritional substance of a real meal, rather than formulated by a team of scientists at an old-school multinational corporation. The fact that Slimfast is marketed to women has no bearing on the distinction. When you’re working on a tiny, game-changing startup, all you need are engineers. Those business-school folks just get in the way and even designers should be hired in small doses. Marketing is fluff for companies that aren’t focused on changing the world. That’s why growth hacking rose as a fundamental startup role. Like marketing, it’s data-driven and helps sell products, but it just sounds more masculine. Nobody will go to stores in the future, primarily because of the human interaction involved (we are well on our way to this reality in San Francisco). The Bodega is like a corner store, but reduced to a locked box inside lobbies of apartment buildings or gyms. It’s a lot like a vending machine, except you can only pay for things with a smartphone, and instead of market research, the available merchandise is chosen by “machine learning.” Don’t worry about what that means — it’s the future. In a city dominated by hills, it’s not surprising San Francisco is so forward-thinking when it comes to transportation. Other cities are just getting on board with a regular Lyft, which is like a taxi, but instead of waving one down you hail it with a smartphone. In just a couple years the service expanded to Lyft Line, which is like carpooling — a bit like an airport shuttle. Now, Lyft offers set routes across the city, the result of years of data collected on the paths frequented by the most people. This sounds very similar to public transportation, but remember, Lyft only works with a smartphone (which everyone has in San Francisco, and all people will have in the future). When it first launched, the idea for Airbnb sounded crazy, but it paved the way for strangers to pay other strangers to stay in their homes — a total win for consumers, who can now afford lodging at more reasonable rates than what’s offered at hotels. The branded apartments, designed to be used as Airbnbs, are similar to a hotel in the sense that you can book a room and check in and out. The difference is, the cost of the building is subsidized by long-term residents responsible for maintaining each room — a total win for the corporation. One of San Francisco’s most-loved innovations is food delivery. Because you order with a smartphone and can track your meal’s movement across town on a map, there’s almost no human interaction, other than accepting a bag of entrees through a half-open door. The senior community in your town might have something similar called Meals on Wheels, which delivers food to people who aren’t able to cook or get food on their own. Uber Eats is different because it’s for people are capable of cooking and shopping but choose not to, and — yes! — you order food only with a smartphone app. Imagine if you were victim to a flood or a fire, or merely dropped your laptop in the bathtub. You might forever lose that genius screenplay you’d just written, or that folder of digital receipts you’re hoping will fend off the IRS. When you save a file to The Cloud, you are saving it somewhere faraway, making bathtime productivity just a little bit more safe. It’s not actually in a cloud, though, because data centers are heavy and using a rocket to propel them into the Earth’s orbit isn’t cost effective (yet). The Cloud is just like someone else’s computer — as if you were storing your garden tools in your neighbor’s much larger shed. In San Francisco, we take deep pride in never doing something a computer could do for us. That includes letting a Roomba vacuum our floors and letting an app call a cab. For especially sensitive tasks such as logging receipts to an expense report or driving a car, we trust soulless computers to do it right where weak humans are slow and require bathroom breaks. When artificial intelligence falls short — by making fake news trend, for example — it is enhanced by human labor. Of course, the humans are there just to facilitate the intelligence of the machine. Isn’t it wonderful to live in a time when computers are smarter than us!? Much like a neighborhood bar, Tinder makes it easy to start a conversation with a potential love interest and ask for their phone number, specifically with people who are nearby, right now. Perhaps the most exciting innovation of Tinder is that when you change your mind and don’t want to talk to someone anymore, you can simply block them — bet you can’t do that with your neighbors. Innovation! Truthfully, it will be very hard to classify companies in the future. Many businesses use a website to sell things, but if your business started online, like San Francisco’s Craigslist, using exclusively a website to sell things, does that make it a technology company? Perhaps. Other companies like Yahoo, Facebook, or Snapchat that sell ads against content that they sometimes pay to create, are probably technology companies just because they employ so many engineers. Besides … nobody wants to admit at a party that they’re in the media business. Dani Fankhauser is the author of Shameless: How I Lost My Virginity and Kept My Faith. Her writing has appeared on Fortune, The Billfold, Mashable, PopSugar, and NY Mag's The Cut.